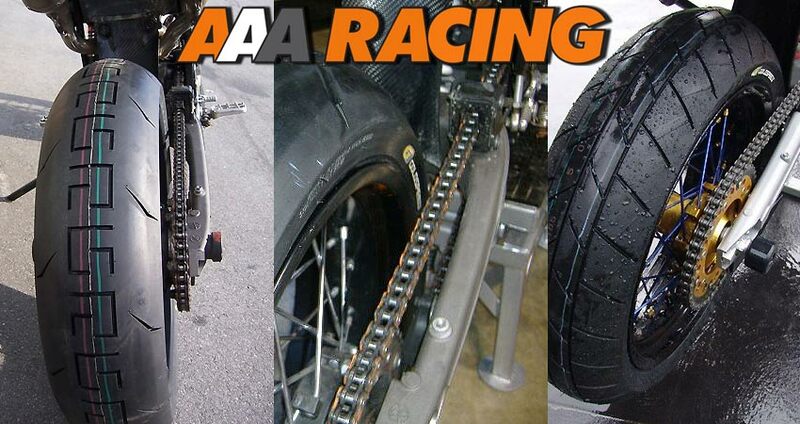 Q Why should I use specific Supermoto tyres on my Supermoto bike? Q How do I know which tyre is best suited for my bike from the Goldspeed range? A We always say use the 80/20 rule. What we mean by that is; work out where you will ride your bike 80% of the time and buy tyres to suit that application, whilst accepting that you'll have to compromise on the other 20%. For example, if you use your bike to commute in all weathers and want to do one trackday a year, then buy road, all weather tyres and accept that you won't be setting the fastest lap on your trackday! The alternative is two sets of wheels as you can choose tyres specific for the current application - but most people don't have this luxury with their road bike. Q I'm concerned about the clearance between the chain and my back tyre. It looks very tight for space and I'm not sure a 160/60 Goldspeed will fit in there without touching the chain. Can you help me? Q I've noticed that some Goldspeed tyres are shown as 'Road Legal' in their Specification tab. Can you explain more? Q How many miles can I expect from my Goldspeed Supermoto Road Tyres? A There are many variables which have a bearing on tyre wear including; your own individual riding style, your body weight, the weight of your Supermoto, ambient temperatures, tyre pressures etc. These variables make it impossible to give an accurate guide although as a rule of thumb, you will generally achieve slightly less mileage than the OE tyres supplied on your Supermoto. However, as Goldspeed Tyres are a direct development from Goldspeed Competition Tyres, you should enjoy lots more grip together with progressive feel as a trade off! 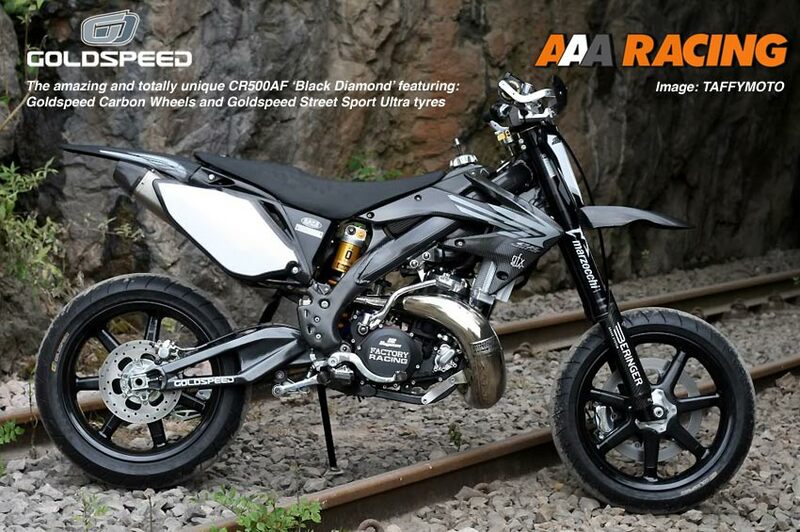 Q What tyre pressure should I use with Goldspeed Supermoto Tyres? Q Why is the word "Goldspeed" or the "Goldspeed Logo" printed in different colours on different tyres? Q How can I check rim size recommendations for a particular type of tyre? Q I've read all this now, but I still can't decide which tyres to use... Any recommendations? Q My local dealer says that he has lots of tyres which "... are just the same as Goldspeeds ...." should I buy these instead? a) If a tyre size is given as 160/60 x 17, this does not mean that the width is exactly 160mm. Manufacturers are allowed a tolerance when sizing a tyre so a tyre could be anything from 156mm to 164mm say and still be marked as 160/60 x 17. The exact width varies dramatically between manufacturer and even, between type of tyre from the same manufacturer, so there are no golden rules here, just an awareness. This means that your existing 150/60 x 17 could possibly be the same width or even slightly narrower than its 160/60 x 17 replacement! i) Contact Us and ask us have we had experience with this bike / tyre combination - we may have! a) Have the rear wheel adjusted so that the rim is slightly off-centre in relation to the hub (birds eye view perspective). 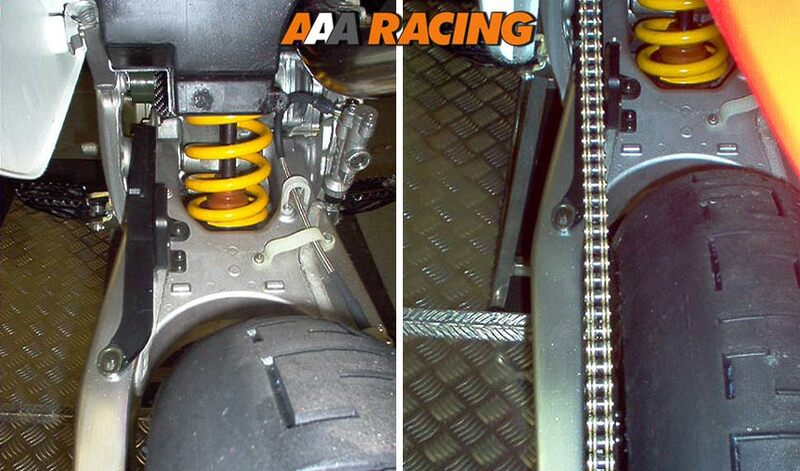 This will give you a small amount of extra clearance between the chain and tyre on the chain side of your rear wheel. Any competent wheel builder can do this for you quite quickly and cheaply, normally without removing the wheel from the bike. It's a measured process which involves adjusting the position of the rim by tightening and loosening spokes accordingly. If you have alloy / magnesium or carbon wheels - sorry this isn't going to work for you!